Hysterectomy is defined as the surgical removal of the most important organ, a female reproductive organ called the uterus. Mostly hysterectomy is performed on women between 20 and 49 ages. There are generally two types of hysterectomy i.e. 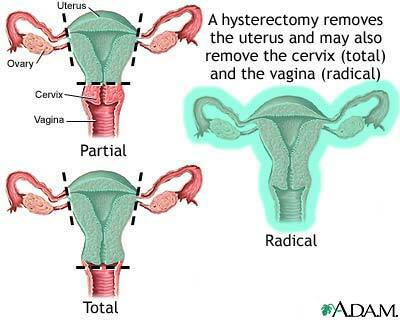 partial hysterectomy and the total hysterectomy. In partial hysterectomy, only the uterus is removed and the ovaries are left in place. In many cases, regarding hysterectomy,as the blood circulation to the ovaries become ceased, the ovarian function generally ceases. In case of total hysterectomy, the fallopian tubes, uterus and ovaries are removed; this would result in the interruption of ovarian hormone production. Women who had undergone hysterectomy are at increased risk of developing arthritis, osteoporosis and heart disease. There are many cases, for example in case of malignant cancer in which hysterectomy is needed. Many hysterectomies are used to remove any fibroid and for the treatment of other related conditions. For these conditions, hysterectomy may not be essential but usually women do not know any alternative treatment which should be discussed with a physician. After undergoing hysterectomy, woman goes into surgically induced menopause which would result in hormone imbalance.